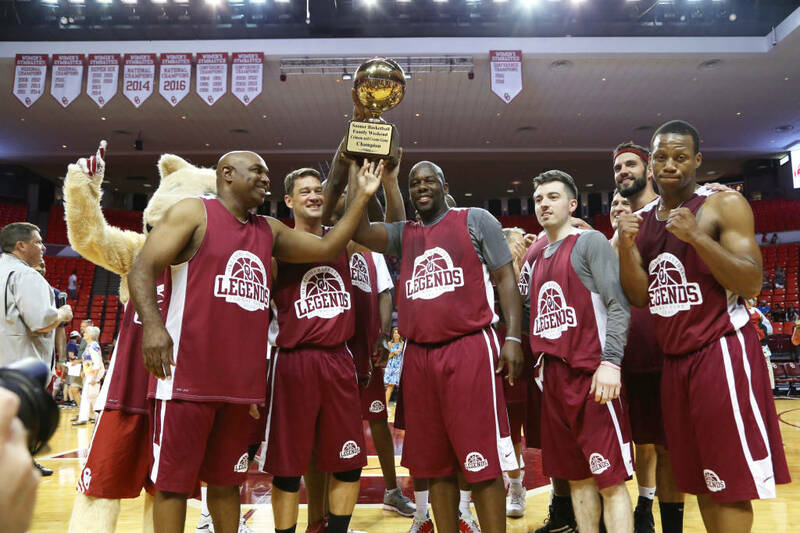 Coached by Sooner great Blake Griffin, the Crimson team secured a 96-89 victory over the Buddy Hield-led Cream team in Oklahoma’s sixth annual Legends Alumni Game at Lloyd Noble Center on Saturday afternoon. An estimated more than 4,000 fans were on hand to watch Griffin and Hield lead the two teams comprised of former Sooners from as far back as the early 1960s. "To have Buddy on one bench and Blake on the other, not many programs can put two players of the year against each other in an alumni game. It was great to see that," OU head coach Lon Kruger said. The Crimson team dominated the majority of the first half, leading by as many as 19 points, before the Cream team chipped away to make it 54-43 at halftime. At the 12-minute mark, an Isaiah Cousins 3-pointer pulled the Cream squad within six points at 73-67, but fueled by three straight 3-pointers, Crimson responded with an 11-0 run to pull away for good. "I never thought of myself as a coach, but I'm undefeated when I come back to do this," Griffin said. "So (coaching) might be something I have to look into after this victory over Buddy's team today." Ebi Ere, who played on OU’s 2002 Final Four squad and is fresh off representing Nigeria at the Olympics, was named the game’s MVP after a 22-point, five-rebound performance for the winning team. Ere was also the MVP in the 2013 and 2014 alumni games. Dinjyl Walker, a member of the 2016 Final Four Team, finished with 19 points and a game-high 12 rebounds for Crimson, and Terry Evans also reached double digits with 10 points. Cousins put on a show for Sooner fans, pacing the Cream team with a game-high 33 points, one shy of the alumni game record, in his first appearance after finishing up his senior season with the Sooners in 2016. Tyler Neal finished with 10 points and five rebounds for Cream, while Skeeter Henry and Aaron McGhee both contributed nine points. Saturday’s game capped off the Family Weekend, which also included Friday’s Tip In Club Golf Tournament and a Tip In Club Dinner at Lloyd Noble Center. Former OU head coach Billy Tubbs was honored at the dinner, and the 2015-16 Sooners received their Final Four rings.